CORPUS CHRISTI, TX – The arrival of spring means it is time to make lawns and gardens look their best. 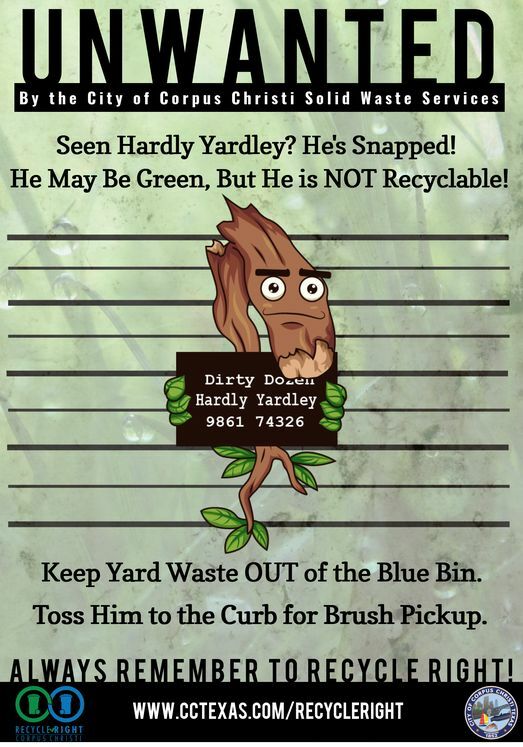 Amid the mowing and pruning, Solid Waste Services reminds residents to look out for Hardly Yardley, the latest character in the Recycle Right campaign. Hardly Yardley, also known as yard waste, should never be placed in the blue recycling bin. This is to prevent branches, leaves, and yard clippings from interfering with the recycling process. Yard waste can be mulched, composted or set-out for brush collection according to the schedule listed in the 2018 Customer Guide. Yard waste can also be taken to the J.C. Elliott Collection Center, Hwy 286 at Ayers Street, Monday through Saturday from 8:00 a.m. to 5:00 p.m. Solid Waste Services and Communities in Schools are using Hardly Yardley and the other members of the Recycling Bin’s Dirty Dozen to teach CCISD students about the importance of knowing how and what to recycle. Learn more at www.cctexas.com/recycleright.